When creating applications, it is not uncommon to have a process that explicitly requires a signature, a form, or an approval process on a set of documents. Often, these end up causing users to download a PDF, print the document, etc. With the dawn of e-signature and form technologies like Adobe Sign, we can easily turn this into a 100% digital process. Adobe Sign can be integrated into your Azure functions using Logic Apps, making it really easy for you to add functionality without burning additional development hours. Let’s walk through the simple process to do this. 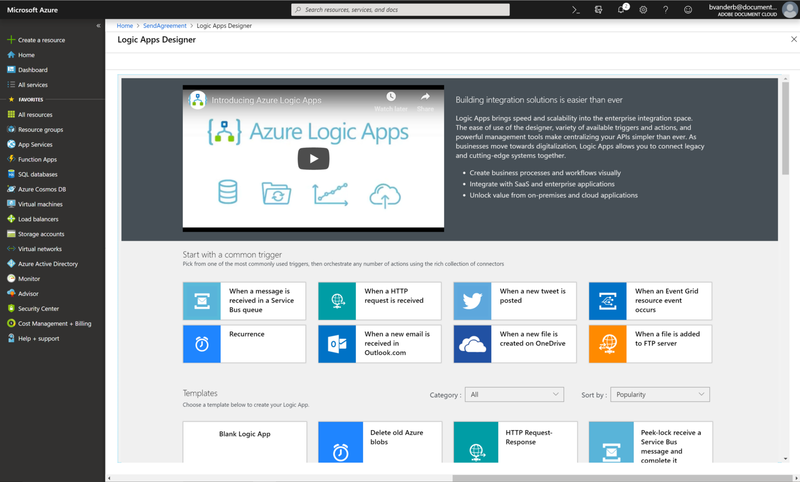 Logic Apps is part of Microsoft Azure and allow developers to design workflows that articulate intent via a trigger and series of steps. It is an easy GUI interface within the Microsoft Azure portal and has more than 250 out-of-the-box connectors including Adobe Sign, Adobe Creative Cloud, Slack, and others. You can easily hook into Logic Apps, and then it takes care of communicating with Adobe Sign without needing to learn the Adobe Sign APIs . If you’re familiar with Microsoft Flow, Microsoft Flow is built on top of Logic Apps and you will feel right at home. Logic Apps is more geared towards developers creating easy no-code connectors, while Microsoft Flow is geared towards IT and end-users. 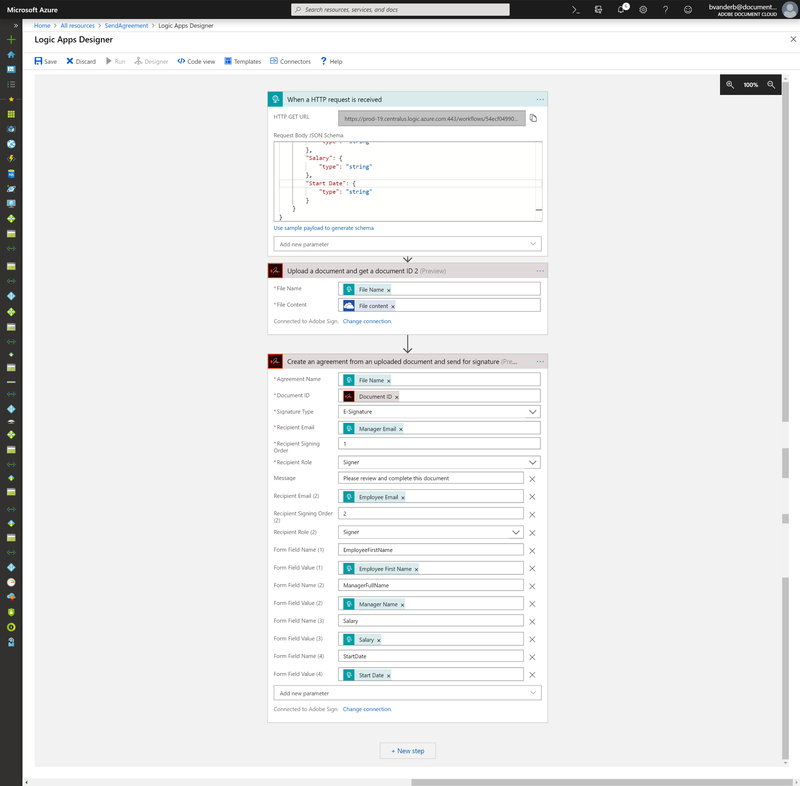 Creating a Logic App from within the Microsoft Azure portal. In the sidebar, click on Create a resource. Search for “Logic App” and select it. Once you are ready, click Create. Now that your resource has been created, you will receive a notification in the top right corner of your screen. Click on Go to resource. In the next sections, I will walk-through some examples of how you can do common calls to Adobe Sign, assuming that you can start a new Logic App using the instructions above. 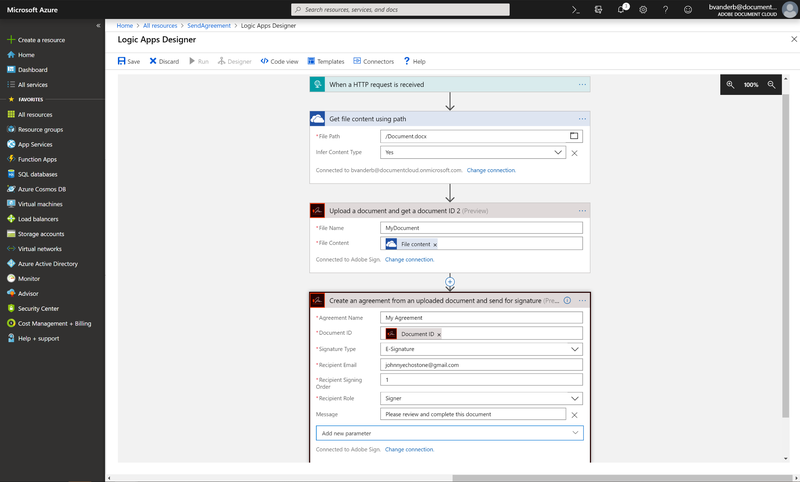 Creating a Logic App is very similar to creating a flow in Microsoft Flow. Now that you have created your Logic App, the Logic App Designer is now asking you if you want to use a template (see screenshot above). While you can choose any of the triggers you desire, in this example we will use an HTTP request. 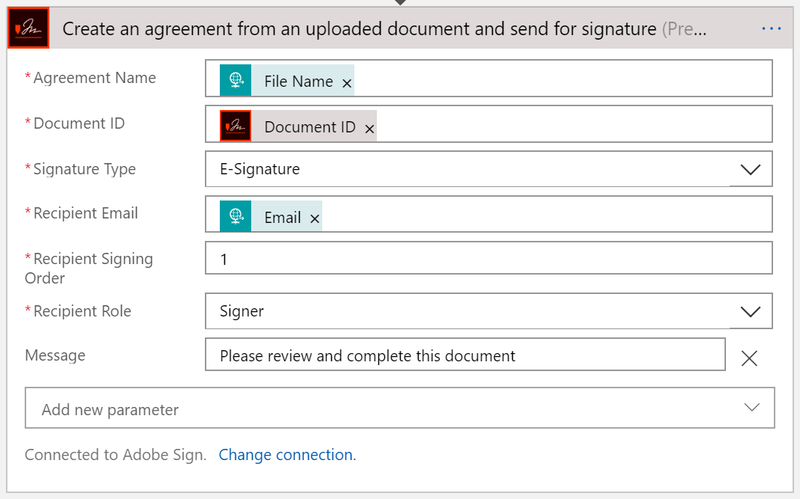 To send a document for signature, you need to either use an Adobe Sign library template, or you need to upload a document as a transient document first before sending an agreement. 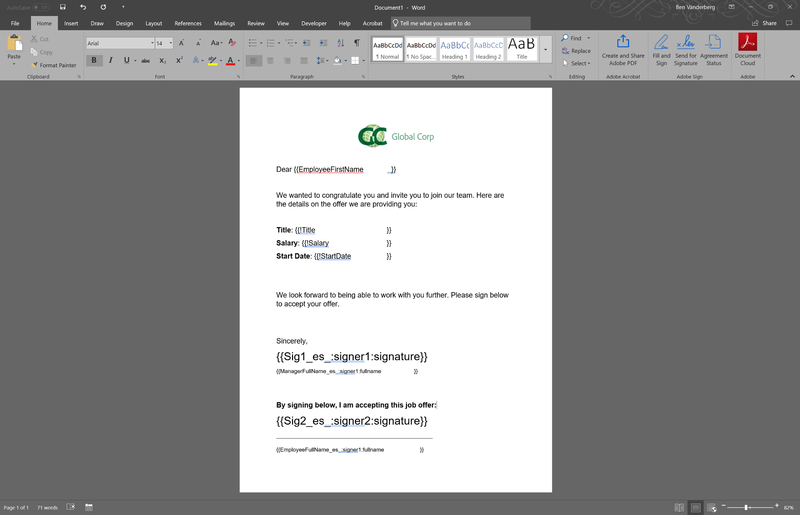 In this example, we will upload a document. In this example we are using OneDrive, but you can use a variety of other connectors such as BOX, Dropbox, SharePoint, etc. Uploads a document as a transient document and returns a document ID for reference. Click on When an HTTP request is received in the list of common triggers. Click on Use sample payload to generate schema. Click Done. This will convert your JSON into a schema for the HTTP request to understand. Setting the method is simply for demonstration purposes. It would make more sense for you to configure a POST request, which you can learn more about here. What you will notice is that there are Adobe Sign Text Tags in the document. The reason for this is we are going to use the Adobe Sign connector in Logic Apps to merge information into the document. Here is a list of each of the text tags used. To learn more about Adobe Sign Text Tags, see here. Under File Path, use the Dynamic Content panel to add File Path variable into the field. This will allow you to pass the variable from the HTTP request into the connector. Set Infer Content Type to Yes. In File Name, use the Dynamic Content panel to set the field to the File Name variable from the HTTP request. In File Content, use the Dynamic Content panel to add File content variable from OneDrive connector into this field. NOTE: If you are using a different source, such as SharePoint, or OneDrive, you might set your filename to include the file extension to ensure the Adobe Sign service recognizes your file type. Set Agreement Name using the Dynamics Content panel to input the File Name variable from the HTTP request. Set your Document ID using the Dynamic Content panel and select Document ID from the list. 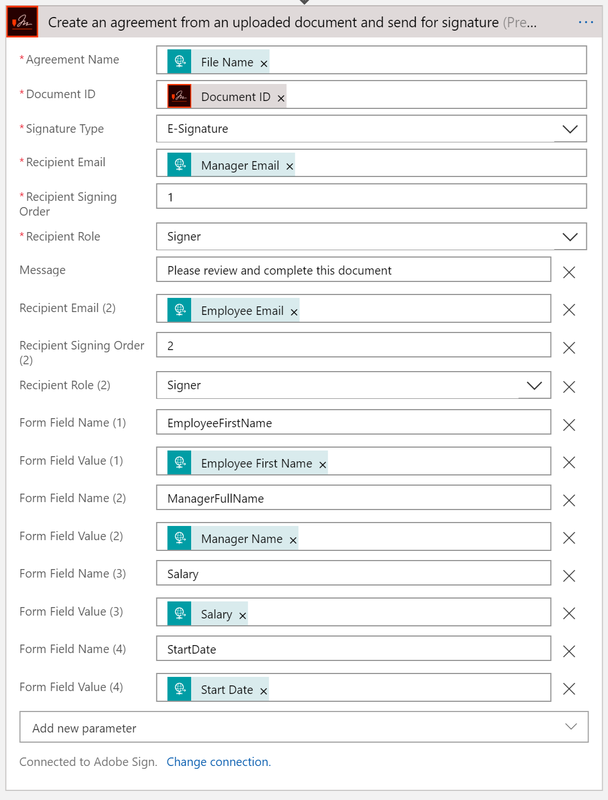 Set Recipient Email using the Dynamic Content panel to the Manager Email variable. In Message, set the message that will display in the notification emails. Click on Add new parameter. If you want to add some more parameters, such as additional signers, fields to merge into the the documents, etc., you can add additional parameters below. Click on Save to finally save your Logic App. Since this flow is triggered using an HTTP request, we can easily test this using Postman. In the Logic App Designer, click on a When HTTP request is received step. Click on the Copy button next to the generated URL. 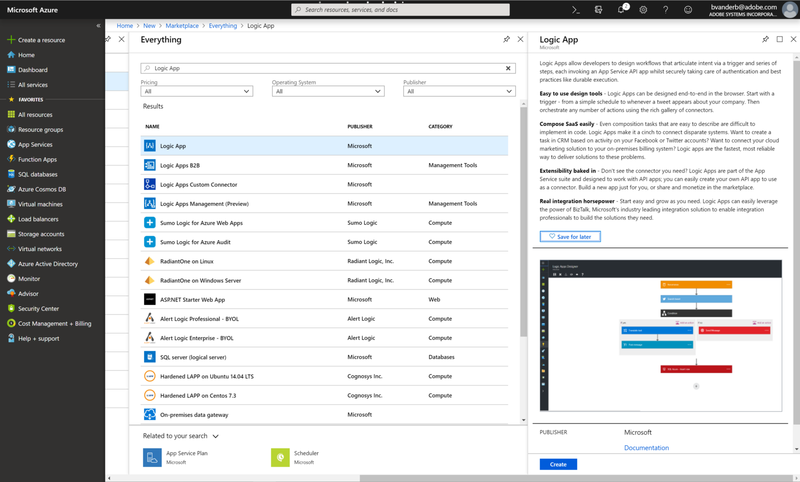 Logic Apps are an extremely powerful, easy way to create connections between your different cloud apps (including Adobe Sign) and your apps in Azure. Consider also looking at some of the ways you can also use the Adobe Creative Cloud connector in Logic Apps to automate things within your creative teams!